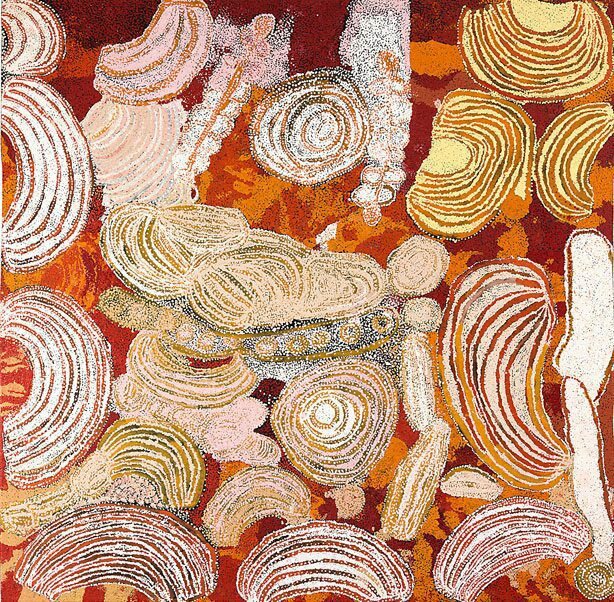 "Minyma Tjuta Tjukurpa (Seven Sisters Creation Story). This is a sacred story for women. Ngayuku ngura (this is my country), Kuru Ala. That man Wati Nyiiru was a cheeky man trying to get the big sister. He turned himself into a snake when all the women were digging for kuka (meat). They dug him up and ate him, but he tasted funny. All the sisters were sick. He is a Ngankari and turned himself into many things." "The seven sisters travelled from near Kaliwarra to Wannan in Western Australia stopping at significant sites and rockholes including Kuru Ala, a sacred place for women. As they walked across the desert they were followed by a wati kula-kula (lustful man) called Nyiru. He wanted to take one of the sisters as a wife, but he was an old man and they did not want him. Near Kuru Ala Nyiru pretended to be a wayanu (quandong) tree. The sisters gathered around to pluck the fruit but when they tasted it they realised that it was not wayanu but Nyiru trcking them. They ran away and hid in a cave, but he followed them, so they ran to another rockhole, where they saw a kuniya (python). The sisters knew the kuniya was really Nyiru so they killed and cooked him, then sang and danced inma."